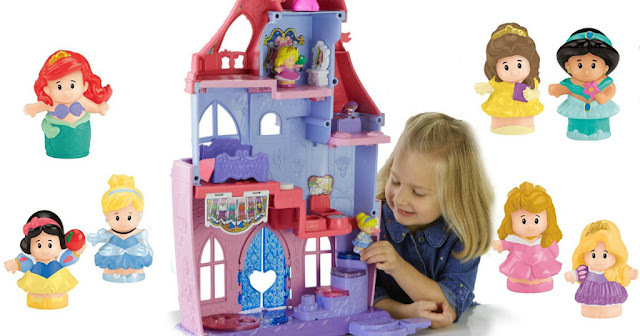 Right now Target.com where they dropped the price on this Fisher-Price Little People Disney Princess Magical Wand Palace down to just $39.99 (Retail $49.99). PLUS...you'll score a FREE Fisher-Price Little People Disney Princess Figures 7-Pack ($19.99 value) with your purchase! No code is needed, the free set will be automatically added to your cart. In addition, if you haven't taken advantage of the Target Toy coupon valid for 25% off one Toy, Sporting Goods or Kids' Art/Craft item when you text TOY to 827438 (limit ONE use only) – your final cost will be $29.99! When shopping online, check the very bottom of your coupon for a unique promo code which you can use at checkout. Shipping is FREE for any size order through 12/23/17, and if you're a Target REDcard holder, you'll save an additional 5% off your purchases!